Transfer to your Emerald Waterways luxury Star-Ship and where you will be welcomed by your Captain and crew. Nuremberg is situated along the Main–Danube canal, an engineering masterpiece linking the rivers of Germany with the mighty Danube which flows from the Alps to the Black Sea. Cruise along the Danube River to UNESCO World Heritage-listed city of Regensburg, one of Germany’s best-preserved medieval cities. On our guided walking tour, you’ll have the chance to see one of the oldest bridges crossing the Danube and see the city’s architectural highlights including the Old Town Hall. Regensburg is also home to one of the loveliest’ Christmas market of the German-speaking countries. With its many quaint wooden stalls, the market is located around the Neupfarr Church and the city Guard House, adorned by row-upon-row of twinkling lights. Taste your way through the narrow streets and hidden passageways, picking up a mug of delicious Glühwein and treating yourself to homemade gingerbread and cookies. Situated within Austria’s wine–growing region, Melk is home to an imposing UNESCO World Heritage-listed 900–year old Benedictine Melk Abbey. The Abbey features Austria’s finest Italian baroque architecture, with its ornate gold leaf walls, 640ft Imperial Corridor and fresco ceilings. 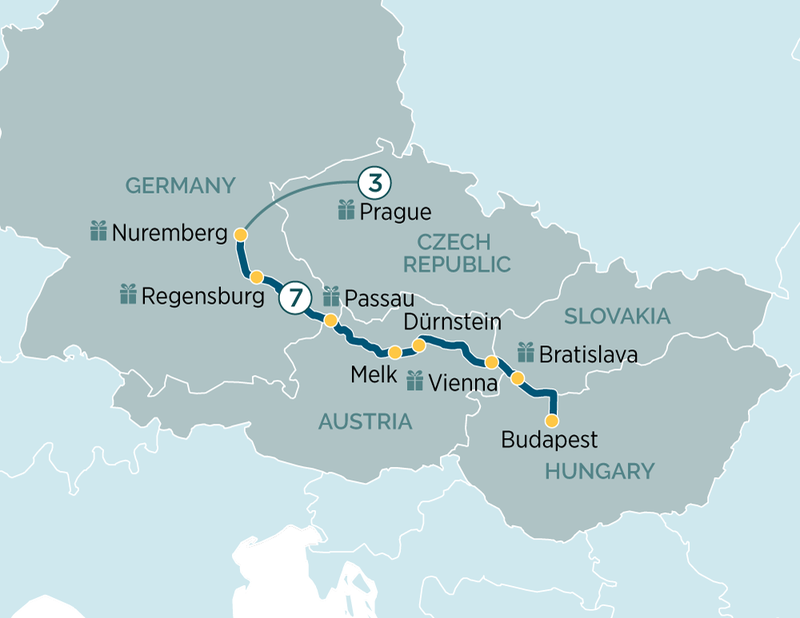 Later the ship sails through the spectacular UNESCO World Heritage-listed Wachau Valley and on to Dürnstein, one of the most enchanting villages of the Wachau wine region. This is the site of the castle where Richard the Lionheart was imprisoned after returning from the crusades in the 12th century.